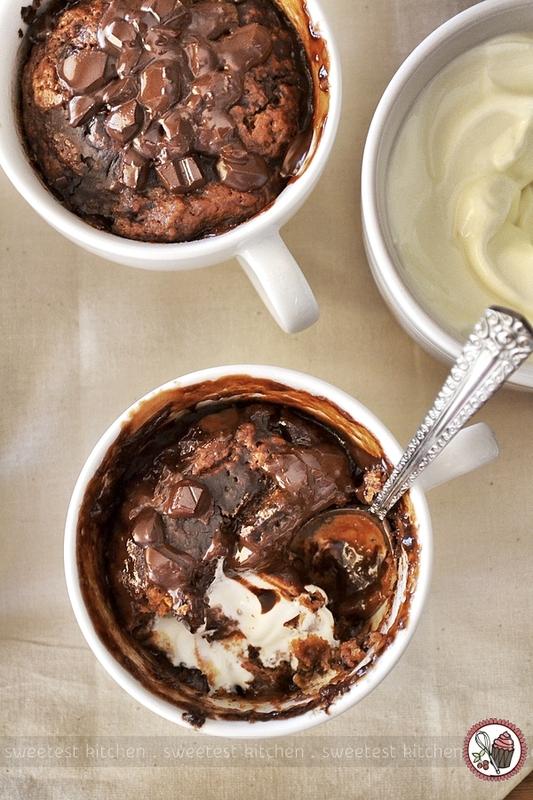 This isn’t just any self-saucing chocolate pudding. It’s a gorgeous combination of light, spongy cake dotted with melted chocolate, while underneath is a layer of gooey, thick pudding. What makes this particular recipe so brilliant is that it’s lightened up with Greek yoghurt, which is one of my most favorite ingredients to bake with. My variations in this recipe included using raw cacao powder instead of regular cocoa powder, and I replaced roughly 1/2 of the caster sugar with coconut sugar (although next time, I might use all coconut sugar), to make it *slightly* healthier. For the chocolate, I used Lindt 70%, of course. When these little beauties come out of the oven, serve them up straight away with a dollop of room-temperature Greek yoghurt. The tang of the yoghurt brings the puddings up to another level, making them completely and insanely irresistible. This recipe has truly won me over and is one of my most favorite recipes I’ve ever made. 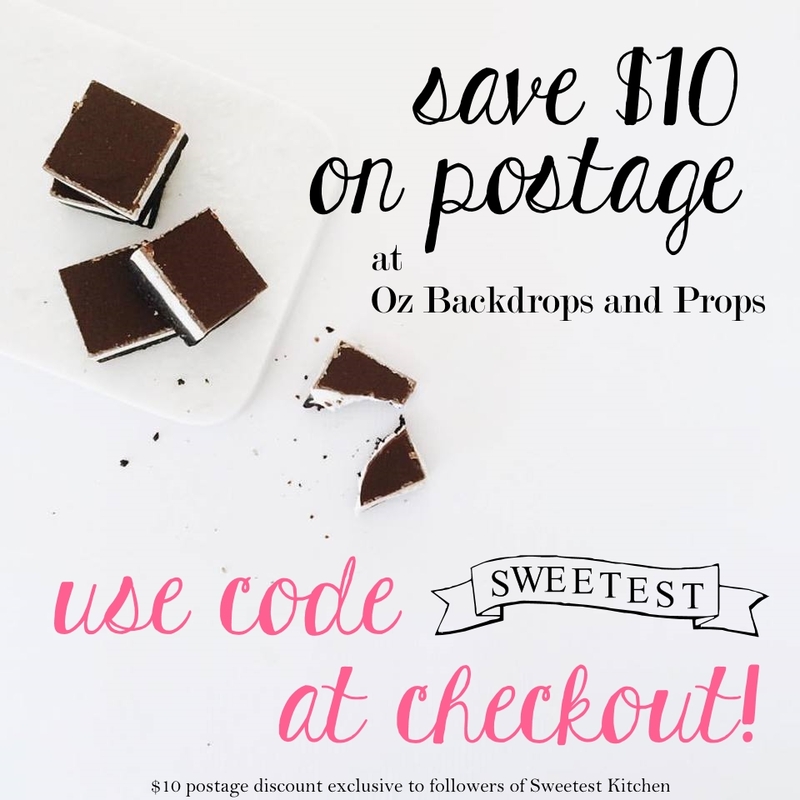 It’s very easy to make and uses basic ingredients from the pantry and refrigerator (presuming you don’t plan on using coconut sugar or raw cacao!). It’s also a great crowd-pleaser, so next time you have guests who are feeling a bit chilly during these autumn evenings, pop into the kitchen and whip up a batch of these. They’ll love you for it! 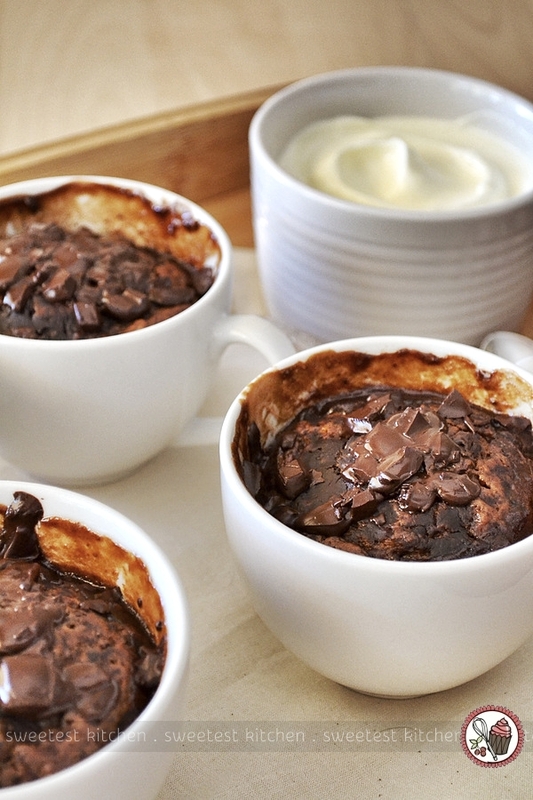 This is a truly decadent and warming self-saucing chocolate pudding, lightened up with the addition of Greek yoghurt. Preheat the oven to 180°C. 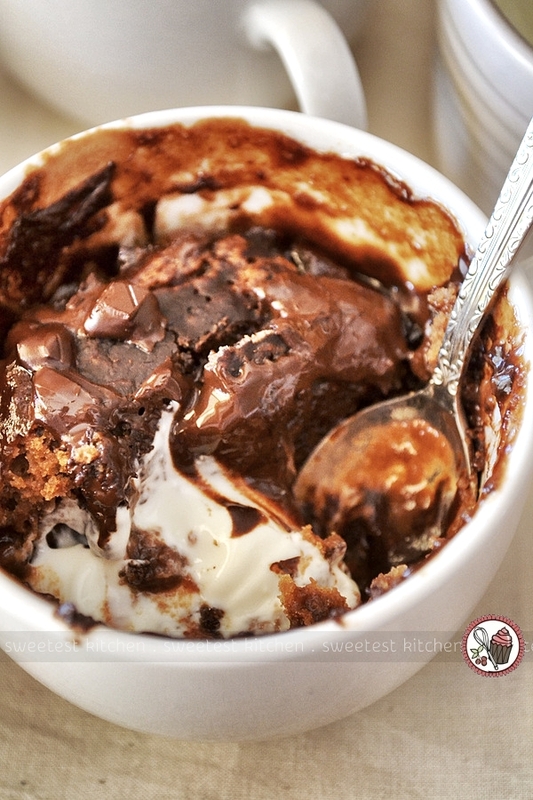 Mix the flour, 3 tbsp of the cocoa powder, chopped chocolate, baking powder and caster sugar together in a large bowl. Stir the yoghurt, butter and egg together in a jug and then stir this mixture into the dry ingredients. 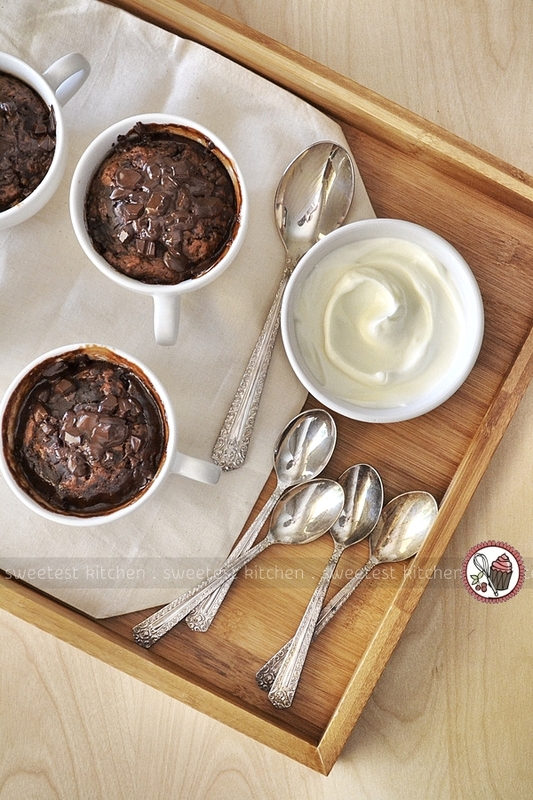 Spoon into 6 smallish ramekins or ovenproof dishes. Place the brown sugar and remaining tbsp of cocoa powder in a measuring jug and gradually stir in 250ml boiling water. Stir until the sugar has dissolved. Pour carefully and evenly over the six puddings and bake for 20-25 minutes, until firm to the touch. Yum, yum, YUM! This looks amazing! These look sooooooo good…definitely making me crave chocolate! These look great! Do you think that baking/cooking with greek yogurt changes the flavour? It depends on what it is you’re baking/cooking, but I find it generally adds a slight “tang” to the overall taste. I’ve found it also often changes the texture of raw batter by making it more airy; raw dough by making it more smooth; and in baked goods by making them more moist. I don’t have any ramekins but I’d get some for this recipe. But please give me a hint: what is the capacity of a “smallish” ramekin?? Looks delicious. Hi KareninStLouis, I used ramekins that hold 250ml (8oz , 1 cup) of liquid. Yummmmmmy! The puddings are amazing. In fact, they are very inviting!